This command will disable any port that a superior BPDU is received on. This is done to ensure a switch will remain root at all times. Next we will configure root guard on the trunk ports. 10:02:52: %SPANTREE-2-ROOTGUARD_CONFIG_CHANGE: Root guard enabled on port FastEthernet0/19. 10:02:52: %SPANTREE-2-ROOTGUARD_CONFIG_CHANGE: Root guard enabled on port FastEthernet0/20. 10:02:52: %SPANTREE-2-ROOTGUARD_CONFIG_CHANGE: Root guard enabled on port FastEthernet0/21. 10:02:52: %SPANTREE-2-ROOTGUARD_CONFIG_CHANGE: Root guard enabled on port FastEthernet0/22. 10:02:52: %SPANTREE-2-ROOTGUARD_CONFIG_CHANGE: Root guard enabled on port FastEthernet0/23. 10:02:52: %SPANTREE-2-ROOTGUARD_CONFIG_CHANGE: Root guard enabled on port FastEthernet0/24. 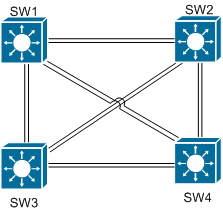 Now we will configure SW2 to become root for all ports. Notice that SW1 is now blocking the trunk ports. 10:08:26: %SPANTREE-2-ROOTGUARD_BLOCK: Root guard blocking port FastEthernet0/23 on VLAN0001. 10:08:28: %SPANTREE-2-ROOTGUARD_BLOCK: Root guard blocking port FastEthernet0/21 on VLAN0017.